The Tucson Jewish Community Center is expanding its sports and wellness facility as part of the nonprofit organization’s Growing with Southern Arizona capital campaign. 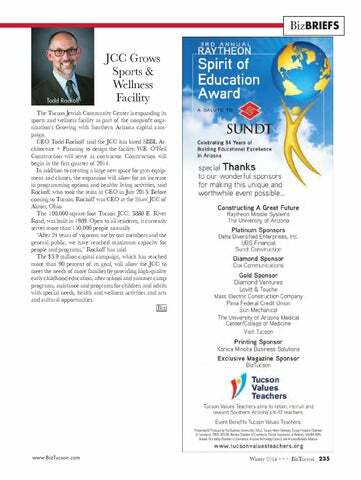 CEO Todd Rockoff said the JCC has hired SBBL Architecture + Planning to design the facility. W.E. O’Neil Construction will serve as contractor. Construction will begin in the first quarter of 2014. In addition to creating a large new space for gym equipment and classes, the expansion will allow for an increase in programming options and healthy living activities, said Rockoff, who took the reins as CEO in July 2013. Before coming to Tucson, Rockoff was CEO at the Shaw JCC of Akron, Ohio. The 100,000-square-foot Tucson JCC, 3880 E. River Road, was built in 1989. Open to all residents, it currently serves more than 150,000 people annually. “After 24 years of vigorous use by our members and the general public, we have reached maximum capacity for people and programs,” Rockoff has said. The $3.9 million capital campaign, which has reached more than 90 percent of its goal, will allow the JCC to meet the needs of more families by providing high-quality early childhood education, after-school and summer camp programs, assistance and programs for children and adults with special needs, health and wellness activities and arts and cultural opportunities.